The frame has the successful inner 'Muscle System' along with 4 Nano Nodes positioned around the frame to Smooth out Vibration and Increase Stiffness for More Power and Control. All frames have our 'Muscle Tec' string system. 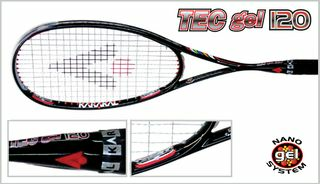 The TEC gel-120 squash racket has an 'Internal Vibration Dampner' bonded into the frame to reduce vibration.